Lisa’s Mexican Restaurant, owned and operated by Alicia Cendejas and her daughter Carla Ruiz, is a growing establishment located near the heart of downtown San Antonio. Lisa’s has a history stretching back over 30 years with its original location on West Commerce. On August 6, 2007, Lisa’s opened its doors at its new expanded location at 815 Bandera Road. Due to Alicia’s constant dedication and incredible work ethic, Lisa’s has grown into the fine dining establishment it is today. Alicia immigrated to the United States from Mexico City. As a single mother, she worked long hours to provide for her two children: Carla and Luis. Alicia’s remarkable devotion and determination earned her the position of general manager which allowed her to later fully earn ownership of Lisa’s. Lisa’s was a breakfast and lunch favorite in the West side of San Antonio for many years. Families and friends knew it as “Lisa’s on Commerce”. The small, low-key atmosphere catered mainly to local families. It was Alicia’s charisma and innovation later on that allowed Lisa’s to grow into the full service restaurant and bar it is today. The true secret behind Lisa’s steady achievement is unquestionably Alicia’s unique management style. Her first priority has always been impeccable customer service because Alicia possesses an amazing ability to make each and every customer feel welcome and important. An added bonus is Alicia’s personalized recipes and menu. On a daily basis Lisa’s food is made from scratch using only the best and freshest ingredients with an extra sprinkling of Alicia’s charm. She provides a loving and caring environment for employees and customers alike. “The Best Mexican Restaurant” and “The Best Neighborhood Restaurant” by the 2009 Readers Choice Awards and the “Blue Plate 2009″ for always having a clean and fresh kitchen and dining room. Most recently in 2012 Lisa’s Mexican Restaurant was awarded “The Best of The City” by San Antonio Magazine. After over 20 years in the business, Alicia, as well as her food, are well known throughout San Antonio and surrounding areas. 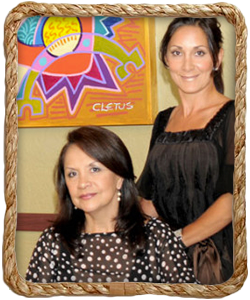 In 2007 Carla joined Alicia in the business and together they expanded and relocated Lisa’s to its current location 815 Bandera Road, where Bandera intersects Woodlawn Avenue. Carla has been an important part in the business development of the new location. She has brought in the leadership needed to grow from a 23-table to a 60-table establishment. Alicia and Carla have also joined efforts to revitalize the neighborhood. They have partnered with St. Mary’s University and the City of San Antonio in an attempt to infuse the area with visitors and new businesses. Their most recent creation is “Affordable Events by Lisa’s Catering and Delivery” to help their customers make their special events memorable and effortless. Affordable Events can cater any large or small event. Alicia and Carla are pleased to be Hispanic businesswomen who have carried an entire establishment from infancy into adulthood. by the 2009 Readers Choice Awards. Lisa’s was also awarded the “Blue Plate 2009″ for always having a clean and fresh kitchen and dining room. After over twenty years in the business, Alicia, as well as her food, is well known throughout San Antonio and surrounding areas. Today Lisa’s is located at 815 Bandera Rd. intersection with Woodlawn Ave. Alicia and Carla joined forces to relocate and expand Lisa’s. Carla has been an important part in the business development of the new location. She has brought in the leadership needed to grow from a 23 table to a 60 table establishment. Alicia and Carla have also joined efforts to revitalize the neighborhood. They have partnered with St. Mary’s University and the City of San Antonio in an attempt in infuse the area with visitors and new businesses. Their ultimate goal extends far beyond the walls of Lisa’s Mexican Restaurant – They intent to assist in refurbishing an entire neighborhood, creating an environment that attracts and welcomes San Antonio residents, visitors, and industries. Their most recent creation is “Affordable Events by Lisa’s Catering and Delivery” specializing to help their customers make their special events memorable and effortless. Affordable Events can cater any large or small event. Alicia and Carla are pleased to be Hispanic business women that have carried an entire establishment from infancy into adulthood.